By executive order, President Calvin Coolidge created the Wupatki National Monument in central Arizona, on December 9, 1924. The monument stands out for its exceptionally high density of archeological sites created by Native Americans of the desert Southwest. The Wupatki region has been inhabited by Native Americans for at least 10,000 years. Over the centuries, various Indian groups occupied the area, with fluctuations in population depending on specific climatic conditions. The most recent major colonization occurred after the 10th Century, when the Sunset Crater volcano, a few miles southwest of the monument, erupted and coated the entire region with layers of volcanic ash. The ash nourished the soil and held water, improving the conditions for agriculture. The low plains of the region were dotted with settlements of Native Americans, known primarily as the Sinagua people. The Sinagua built large structures from stable red sandstone rock, held together firmly by mortar. Consequently, they were able to build multi-story settlements with as many as 100 rooms. The Indians abandoned the structures around 1250, for unknown reasons, but presumably because less favorable climate caused failure of local agriculture. 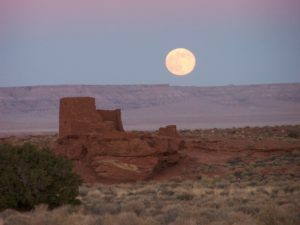 The monument was designated “…to preserve and protect thousands of archeological sites scattered across the stunning landscape of the Painted Desert and the grassland prairies….” A survey during the 1980s catalogued an estimated 2700 archeological sites in Wupatki, and several thousand more exist in nearby areas. Some are the large structures for which the monument is well known, but other are distributed throughout the monument’s 56 square miles (about 35,000 acres). The museum contains nearly 500,000 catalogued archeological items, making it a highly significant historical research repository. Wupatki National Monument also has significant natural resource value. The large acreage is mostly undeveloped and at some distance from major human settlement (Flagstaff is about 26 miles away). Consequently, the monument provides a wilderness-like setting (although not formally designated as a wilderness), with unbroken vistas of juniper woodlands, grasslands and desert scrub communities against a backdrop of sandstone cliffs and the looming San Francisco mountains. More importantly, it provides dark night skies and natural soundscapes. As the noise of modern civilization increases, the natural soundscape of Wupatki is a natural resource all its own, useful as a baseline for understanding changes in soundscapes across the region and nation. Desert USA. Wupatki National Monument. Available at: https://www.desertusa.com/wup/du_wup_desc.html. Accessed December 7, 2017. National Park Service. 2015. Foundation Document, Wupatki National Monument, Arizona. May 2015. Available at: https://www.nps.gov/wupa/getinvolved/upload/WUPA-Foundation-Document-Web-Final-May-2015.pdf. Accessed December 7, 2017. National Park Service. Wuptaki National Monument, Arizona. Available at: https://www.nps.gov/wupa/learn/historyculture/places.htm. Accessed December 7, 2017.